American Patriot Getaways is the premier resource for Gatlinburg cabins for rent and we want you to know: Gatlinburg is an amazing city! With rich history and a great atmosphere, so below you will find some information about the city we love so much. If you have any questions about cabins in Gatlinburg please don’t hesitate to call us at . The first settlers to Gatlinburg came from South Carolina and held the family name of Oglesby, which was later changed to Ogle. Martha Jane Huskey Ogle brought her seven children to the area and built her cabin, which can still be seen today at the Arrowmont School of Arts & Crafts' campus right in downtown. Gatlinburg still has many reminders of the Ogle family’s existence today, such as hotel names, craft shops, and area landmarks. The area in which they settled in the early 19th century became known as White Oaks Flats. This area, which had never been settled before, was thick with thriving forests and wildlife. The local Native American tribes were the only human inhabitants and finding a way to live in peace proved to be difficult. Eventually, the pioneer settlers made the area their home and veterans of the Revolutionary War came to settle in White Oaks Flats from North Carolina. The fifty-acre land grants in Tennessee given by North Carolina made this possible. Geographical boundaries made communication with the world outside of the Appalachian Mountains difficult. Mail service became available in around 1855 as a post office was opened in the mercantile owned by Radford Gatlin, who arrived from North Carolina in 1855 and was soon to have the town named after him. The postmaster, Richard Reagan, renamed his office Gatlinburg in appreciation of the office space offered by Gatlin. This name eventually spread to all of the establishments located in White Oaks Flats until the original name became obsolete in the late 19th Century. Radford Gatlin, known for speaking his mind and holding Confederate views in a primarily Union supported area, was disliked by many. Upon sharing his views one too many times, a group of masked men, thought to be members of the Ogle family, beat him and he was eventually run out of town around 1860. Regardless of this history, the town known today for family fun, entertainment, recreation, and natural beauty is still called Gatlinburg. In the early 1900's, Gatlinburg was a quaint town with only one hotel used by loggers and their families on weekends. After a hard week of work in nearby logging camps, workers would join their spouses and children for a weekend in Gatlinburg. Gatlinburg eventually became more tourist oriented with the establishment of a few specialty shops. Over the years, hundreds of shops have been built. Major attractions, great restaurants, convention centers, and many luxury hotels make up the heart of downtown Gatlinburg. Thousands of romantic chalets are available for vacation rental throughout the mountainous area of Gatlinburg, and a ski resort sits atop a mountain overlooking downtown Gatlinburg. This romantic city is located at the entrance to Great Smoky Mountains National Park. It is the second most popular place to get married in America and is the perfect place for a honeymoon or a weekend filled with romance. 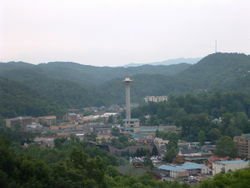 Many large conventions are held in Gatlinburg year round as are annual festivals and other special events. Very popular are arts and crafts shows which take place throughout the year. Religion was important to the settlers and before they had church buildings, they held services outside or in homes. Although this area was settled by Presbyterians, their first church was Baptist. History records that the White Oak Flats "arm" of the Sevierville Baptist Church convened in the early 1800s on Baskins Creek, probably at the present location of the Ogle cabin. Under the guidance of the Reverend Richard Evans, a second church was built on River Road near the mouth of Mill (now Le Conte) Creek, and in 1837, they formed a new church and called it White Oak Flats Baptist. The congregation then met in a log cabin on Baskins Creek which also served as a school. The first frame church building was constructed in 1875, at the corner of the Parkway and Baskins Creek Road (see historic plaque on the sidewalk). The congregation changed its name to Gatlinburg Baptist Church in 1932; in 1951, they constructed a landmark stone church at the same location. Casual attire is what it is all about and that's a big part of being on vacation in Gatlinburg, Pigeon Forge and the Great Smoky Mountains. It's pretty much the standard around here. We have a couple of restaurants where you might feel like sprucing up a little, but it's really up to you. A perfect balance of rustic seclusion and modern convenience settled at the foot of Mt. Le Conte, Gatlinburg, Tennessee serves as one of the primary entries to the Great Smoky Mountains National Park. Original home to the Cherokee tribes, and then later the first Scotch-Irish, German, and English settlers, the Great Smoky Mountains are rich in history and culture, and provide the ideal vacation setting for those wishing to escape the demands of everyday life for family fun, entertainment, recreation, and outdoor adventures. Known for its convenience to entertainment venues such as Pigeon Forge, Dollywood, and the Great Smoky Mountains, Gatlinburg continues to be an annual draw for people of all ages and interests. Over 11 million people every year choose to spend their vacations in Gatlinburg, surrounded by the beauty, culture, and quiet drama of the Smoky Mountains. Whether you wish to tour Country Music Theaters, outlet malls, The Gatlinburg Aquarium, or spend a day hiking in the Smoky Mountains, you'll find that there is always something new and exciting to pique your family's interest. Kids will love the roller coasters other rides at the many amusement parks in and around Gatlinburg, as well as the cloud-chasing trams, scary ghost shows, and miniature golf. Mom and dad can relax and enjoy a delectable meal in one of the many dinner theaters, replete with award-winning, live entertainment. All of this is just minutes away from the cabin hideaways and luxury lodges nestled in the serene, foliate arms of the Great Smoky Mountains and offered by American Patriot Getaways. Bring your family to see the abundance of beauty, shopping, and entertainment for yourself! Within this walking community are family attractions and things to do in Gatlinburg at nearly every turn. Enjoy downhill snow skiing at Ober Gatlinburg, rafting Class IV whitewater, golf, hiking options from 600 miles of trails, and fishing in hundreds of miles of streams: the entertainment of the Great Smoky Mountains is both exhilarating and close by. Explore other great Gatlinburg attractions at one of its unique museums, craftsmen fair, miniature golf courses, or motion simulators, or enjoy go karts or bumper cars, Ripley's Aquarium, haunted houses, or ride the sky lift up the mountain. Everywhere you turn, you'll find plenty of things to do in Gatlinburg, TN! So make plans now to stay in one of American Patriot Getaways 350 + luxury log cabins, chalets or condos. There are so many great reasons to visit Gatlinburg throughout the year! Some of these are explained below, by season. Generally speaking, weekends are much busier than weekdays, and holiday periods are very active. As a result, the primary artery into Gatlinburg, Highways 66 at Interstate 40 & Exit 407 and Highway 441 South, can become heavily congested during these periods. The county is currently working on solution for this congestion that should be completed very soon. Be comfortable... The most important thing you'll bring will be your walking shoes. Tennis, running, loafers, or hiking shoes are the norm — even if you don't get near a hiking trail, you'll likely walk four or more miles per day. The night mountain breeze can feel cool, even in the summer, so a light jacket or sweater might come in handy. As for attire, casual is what the mountains are all about! Even the finest restaurants, and there are plenty, love the comfortable look! Incidentally, folks from Tennessee really DO wear shoes! Springtime in the Smokies! Try to imagine being surrounded by the lush new growth of the forest, delicate wildflowers of all colors, crisp waterfalls of melted snow, and newborn wildlife awakened to bask in the bounty of freshness. There's no better place to satisfy a case of spring fever than in Gatlinburg and the Great Smoky Mountains. Gatlinburg knows its place in the mountains and strives to provide the visitor with a park-like feel along its streets and sidewalks, aided greatly by the full-time staff that oversees the City's year-round flower program. Beginning in March, visitors witness Gatlinburg's transformation into spring when the city's streets overflow with baskets of beautiful blooms and flowering bulbs. Live entertainment can be found along the city sidewalks, adding a festive flair to the time-honored Downtown Parkway stroll. Spring break is a popular time to visit, and can last a full six weeks from March through mid-April, based upon various geographic markets' school schedules. Quieter periods run from mid-April through late May, although visitors and residents alike dedicate those weeks to jump into Ribfest & Wings, Sidewalk Arts Festivals and Scottish festivals that all provide great entertainment during your visit! Gatlinburg's in full swing, and the nearby major theme parks and theaters are open on abbreviated schedules, so you won't be lacking for something to do! Spring temperatures range from chilly to cool at night, with the days running cool to moderate. School's out and summer's here! Summer vacation travel to Gatlinburg and the Smokies is a new experience for some couples and families, but to most it's an every-year pilgrimage! There's just something especially inviting for each member of the family, and collectively for the entire family as well. Outdoor activities abound! For the sports enthusiast, there's hiking, fly fishing, cycling, whitewater rafting, horseback riding, just to name a few. And don't forget the picnic basket! Grab an inner tube and ask a local about their favorite swimmin' holes in those sparkling mountain streams, or just dangle your feet from a streamside stone… even on the warmest summer days, the water's cold! Entertainment parks and attractions provide days and nights of laughter and excitement as well, and numerous of them are indoor activities, just in case you get caught in one of those cooling summer showers. Shops and the crafts community offer extended operating hours, just so you'll have time to get it all in. Summer events include the nation's first Independence Day Parade at the stroke of midnight, a huge Craftsmen's Fair at the Convention Center in July, and Heritage on Display in the Arts & Crafts Community in late August. Quieter periods during summer are the first two weeks of June and the last two weeks of August, with a slight lull the last two weeks of July. Summer temperatures range from cool to moderate at night, and moderate to warm during the day. Warming showers can occur for brief periods in mid-afternoon, so an inexpensive poncho is a good take-along. Arguably the most beautiful of the Smokies' four distinct seasons, the warm, sunny days and cool, clear nights of September, mixed with just the right amount of rainfall, soon transform 800 square miles of lush green forest into a brilliant palette of autumnal color. Starting at the mountain peaks in late September and moving down to town and the lower elevations through early November, Gatlinburg becomes surrounded by the most beautiful skylines you'll ever see, bringing about the spectacular finale to yet another growth season in the Park. Townsfolk take great pride in decorating their businesses and sidewalks for fall, and you'll find a bevy of cleverly designed displays throughout the entire city. During most of October and Thanksgiving weekend as well, the downtown Convention Center features arts and crafts fairs of almost every form. And the first Wednesday evening in November, there's a big chili cook-off and street party to celebrate the kickoff of the city's winter lights program. You don't even have to wait for winter in order to enjoy ice skating at Ober Gatlinburg's huge year-round indoor rink! The University of Tennessee is just an hour from Gatlinburg, so don't be confused if you think you're at a football tailgate party when the Vols are playing a home game on Saturday. Visiting Tennessee Vol fans and opponent states' fans, the likes of Gators, Tigers, Wildcats, Lions, and even Bulldogs and Hogs, sport their colors, their flags, and their pride for up to a week in advance of the game! Quieter periods are weekdays in September to mid-October, then from the last week of October until Thanksgiving Day. Little known tip: The beauty of the autumn leaves typically continues into early November in town, finishing out with the most brilliant red leaves of the maple. Fall temperatures generally range from cool to chilly at night, and cool to moderate during the day. A sweater or lightweight jacket is a good idea to pack. The bears are slumbering, the leaves have fallen, and temperatures are falling as well. All of these effects signal wintertime in the Smokies, and snow-capped peaks and winter activities make Gatlinburg a popular resort even during the winter. Many from the temperate South come in search of seeing snow for the first time, and those from Northern states come to visit in hope of getting away from the snow! Even though it may not be on the ground in downtown (but it might! ), the higher elevations of the Smokies often provide picturesque panoramas of snow-laden mountaintops. The most popular winter activities in Gatlinburg are snow skiing or snowboarding, ice skating, and gathering near the fireplace in your American Patriot Getaways cabin, chalet or condo,. The shops and attractions are open throughout winter in Gatlinburg, although some revert to reduced hours during weekdays. The big events of the winter include millions of lights and enormous lighting displays throughout the city's Winterfest celebration, Gatlinburg's Fantasy of Lights Christmas Parade, and the midnight fireworks show downtown to bring in the New Year. Quieter periods are weekdays throughout the winter, except between Christmas and New Year's Day. Winter temperatures can be fickle, but generally range from teens to thirties at night, and chilly to cool during the day. The climate in Gatlinburg is almost perfect. Summer is usually balmy with an average temperature of 84 degrees. Winter is moderately cold with an average temperature of 39.2 degrees. Gatlinburg is in the Eastern Time Zone. In April we switch to daylight saving time. We revert back to Eastern Standard Time in October. The Gatlinburg/Pigeon Forge Airport, 12 miles from Gatlinburg has complete airport facilities for small private aircrafts.